Looking for a quality, useful item to hand out at the next tournament or event you are invited to participate in? is made from 2 aluminum sheets with a great feeling rubberized grip. The removable ball markers are customized with your company’s logo in full color. 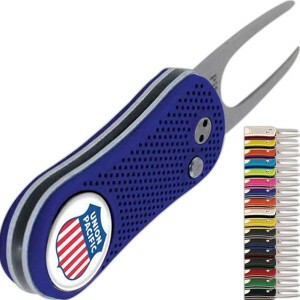 This sleek, European design divot tool has a durable spring-action metal divot tool opens and closes for compact, safe storage. ABS handle with touchable rubberized coating. The full color ball marker is magnetized to safely fit on the side of the tool. Handle colors: fluorescent pink/silver, fluorescent yellow/blue, royal blue/silver, red/white/blue, orange/silver, light blue/blue, gunmetal/royal blue, yellow/silver, white/black, gunmetal/silver, gunmetal/red, gunmetal/green, red/silver, green/silver, black/silver, orange/blue or yellow/blue. Pitchfix (R) size: 2 3/4″ x 1 1/4″. Ball marker size: 7/8″. 50 min at 11.90 ea, 150 at 10.98 ea, 300 at 10.17 ea, 500 at 9.61 ea. Set up is 40.00.